Christy Mathewson was a gentleman of the game and a sight to behold on the mound according to those who had the fortune of watching him play. He is the only pitcher to appear on the top ten lists for career wins and career ERA. As such, vintage Christy Mathewson cards and autographed memorabilia command top dollar on the secondary market. 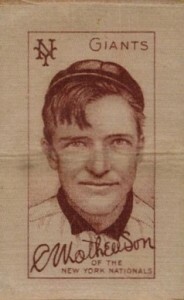 Mathewson was inducted into the Baseball Hall of Fame as part of its inaugural class in 1936. His body of work and career achievements certainly justify his collectibility in the hobby even today. Mathewson ended his career with some lofty numbers that include 373 wins, 435 complete games, 79 shutouts, and a 2.13 ERA. In addition to this impressive list of statistics, Mathewson is a World Series champion (1905) and two-time pitching Triple Crown winner (1905, 1908). 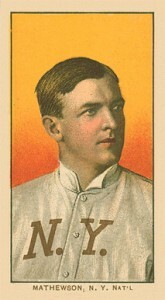 Mathewson played his entire 17-year career with the New York Giants. 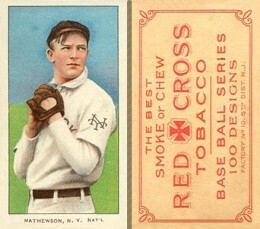 Christy Mathewson has numerous pre-War trading cards issued through traditional means of the time period including tobacco, candy, caramel and strip cards. 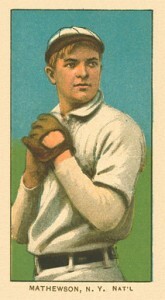 Mathewson's first cataloged cards are from the 1902 Sporting Life Cabinets series. Some of the most highly coveted early Christy Mathewson cards are found within the famed 1909 T206 set, where he has three different cards and 27 total variations. This classic portrait of Mathewson is part of a 561 card set. Designated in the American Card Catalog as W600, these cabinet cards measure 5 by 7 1/2 inches. 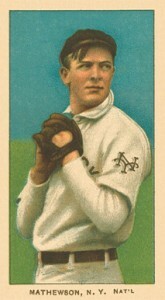 This is one of two cards Mathewson has in the set. It is also the most desirable of the two. The other card shows him in regular clothing as compared to his uniform. 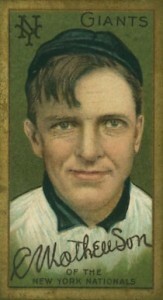 Mathewson has three different 1909 T206 cards, each with a different image. Collectors tend to gravitate to card #307 for it's more realistic facial expression, posed pitching stance and full uniform. When you take into account the numerous variation backs, Mathewson has a staggering 27 total cards in the set. Backs include: American Beauty, Broad Leaf, Cycle, Black Lenox, Brown Lenox, Brown Hindu, Drum, Old Mill, El Principe de Gales, Sweet Caporal, Piedmont, Factory 42, Red Hindu, Polar Bear, UZIT, Sovereign and Tolstoi. There are a total of 524 different numbered cards in the T206 set, each measuring 1 7/16 by 2 5/8 inches. While this might be considered to be the "poor man's" T206, it will still cost you. Obviously very similar in design to Mathewson's #307 card from the T206 set, this version is highly collectible. This truly remarkable set would not be complete without Christy Mathewson. The vivid colors and intricate detail of the full-body length pose are truly stunning. Designated as T3 in the American Card Catalog, these over-sized pieces measure 5 3/4 by 8 inches. The set has 131 cards. The condition-sensitive nature of these pieces, combined with not really being a "card" makes their peculiarity highly collectible. Measuring 1 7/8 by 3 inches, there are a total of 93 cards in the set. They are designated in the American Card Catalog as S74. Using the same posed head shot as the Silk card above, T205 cards incorporate traditional card stock and color. Defined by their gold borders, the design elements combine to form an aesthetically pleasing card. While still listed as the same card number, as you can see, there are two different versions of the card. In addition, back variations can be found for various tobacco brands including Hindu, Cycle, Drum and Broadleaf. 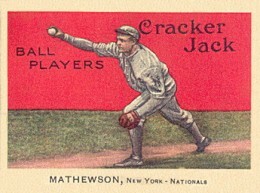 The 1914 Cracker Jack card is one of the few cards that depicts Christy Mathewson in an action pose. The bright red background, type font and image detail make it a collector favorite. The cards measure 2-1/4 by 3 inches. 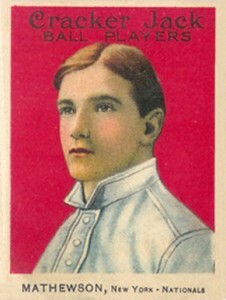 The 1915 Cracker Jack set has always been considered easier to complete due to the fact that the company offered a mail order deal for the set's sophomore season. 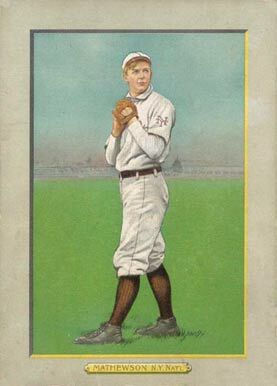 Collectors were in for a real treat to discover that unlike the other cards in the set, Christy Mathewson's was an entirely different card from the previous year. 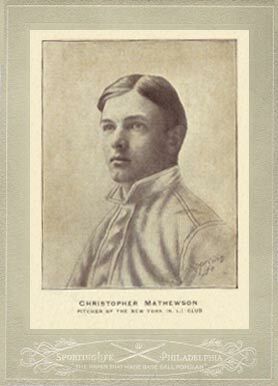 Both of Christy Mathewson's first memorabilia and cut signature cards were produced by Upper Deck. He had a total of four different one-of-one cut signature cards from two different products, 2001 Upper Deck Legends and 2001 Upper Deck Hall of Famers. In each product he has a single cut signature card and another that groups him with his fellow members of the Inaugural Hall of Fame Class of 1936: Babe Ruth, Honus Wagner, Ty Cobb and Walter Johnson. Since the, Mathewson has had additional cut signature and memorabilia cards, but in limited numbers. He also has base cards and inserts in many modern products, the majority of which are extremely affordable. 1909 M101-2 Sporting News Supplement Christy Mathewson BVG 6.5 Close to NM! When looking to purchase authentic autographed memorabilia from legendary and long deceased players like Christy Mathewson, great caution is urged. The Cardboard Connection only recommends buying authenticated Walter Johnson signature autographs from one of the reputable authenticationservices in the industry, PSA or JSA. The most common items found to be authentically signed by Walter Johnson include checks and personal documents. Cut signature trading cards from manufactures like Topps, Leaf, Tristar and Upper Deck should also be considered legitimate.